Consider the benefits of hiring home care agencies in NYC and contact an agent from Care 365 for your home health care needs. At Care 365, we provide homecare that is always available, regardless of the time or day. When you need us, we’ll be there, with support, answers to your questions, and a wide range of options in at-home care. As our name indicates, our professionals are on-call 365 days of the year- so you’ll never experience a black out date of time when you call and find us unavailable. 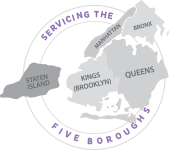 We understand our clients’ need for affordable home health care, and we are committed to delivering to a higher standard than what you would normally find with other home care agencies in NYC. If you’re recovering from an illness and require a rehabilitation specialist to help you on a daily basis, we can provide a professional to come in to your home and work with you to improve range of motion or performance through activity. We receive a lot of calls from clients asking whether we offer speech therapy, physical therapy, occupational therapy, and nutritional counseling- and we love being able to say ‘yes’ to their questions. Many of our clients have family members who require daily assistance taking a bath, dressing, brushing their teeth, or toileting. Aide tasks are another area our professionals are highly skilled in. We can come in and provide assistance with cooking, skin care, incontinence care, and many everyday activities that make life easier when someone can help. Feel free to call a Care 365 agent to discuss your Aide task needs. Some of our clients require more than just everyday aide tasks, which is why we employ full-time professional nurses who are on-call to provide injections, catheter assistance, wound dressing, medicine administration, comprehensive assessments, enemas, monitoring, and support for hospice patients. If you or a loved one requires this level of care at home, give us a call, and we’ll let you know how we can help. Most home care agencies in NYC hire professionals who are fluent in English and/or Spanish. At Care 365, we know multi-cultures are living in the city. Many of our clients have inquired as to whether we can speak their family member’s language- and in the vast majority of cases, we can answer that question positively. You can see a complete list of languages our full-time professionals speak fluently by visiting our website and clicking on our ‘Services’ link. Consider Care 365 for more advantages and benefits than all other home care agencies in NYC. Call us for assistance in submitting your Medicaid application or for more information about the CDPAP program that can allow you to hire any caregiver you want- even friends or family members. We’re always just a phone call away.